Sunset-I have beenv trying since yesterday to get a sunset. 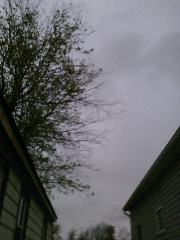 Because of Hurricaine Sandy though we haven't seen the sun in a while. I'm glad I did this project. While some days it made me revisit memories that I like to tuck away, others it made me remember the good times I had through out my pregnancy and Gavin's much too short life. Thanks to Carly Marie for creating this way to release many angel mommies across the globes grief. I will always love and miss you my sweet baby. Until we meet again. I didn't realize that you lived so close to Hurricane Sandy - hope that you and your family have been alright!! I love the picture of your sky - it reminds me of the way I feel some days.